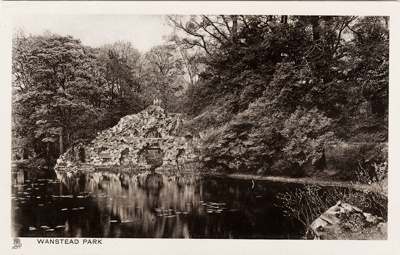 The primary purpose of the collection is to be a repository of images recording the historic appearance, management and use of Wanstead Park and its wider landscape. Also included are a few of other subjects which illustrate broader themes or are in some other way related to the compiler's interests. Wanstead Park, as defined by Historic England, covers approximately 400 acres, and is a Grade II* listed historic landscape. Ownership of the park is divided between four landowners – the City of London (76%), Wanstead Sports Grounds Ltd. (22%), the Parish of Wanstead (<1%), and the London Borough of Redbridge (<1%). The portion owned by the City is managed as part of Epping Forest, though part of the site was acquired separately and has its own by-laws. •	It has important surviving features of a nationally significant landscaped garden, laid out between the seventeenth and nineteenth centuries. •	The public areas are an important local amenity: with an estimated 200,000 visits per year, Wanstead Park is one of Epping Forest's eight most popular sites. •	The park is also an important refuge for wildlife, particularly waterfowl. Wanstead Park was enclosed shortly after 1500, while under Royal ownership. It was used by Henry VII and his successor as a "maison de retraite" and base for hunting. After a period in which it seems to have fallen out of favour, Wanstead passed to Lord Rich of Leez in the 1550s and thereafter became a favoured country seat for a succession of prominent owners. The Tudor-period house was to be replaced by the "princely mansion" of Wanstead House, built 1715-22 for Sir Richard Child, Bt., later Viscount Castlemaine and (from 1734) Earl Tylney of Castlemaine. Designed by Colen Campbell with some input from William Kent, this important precursor of the Palladian revival was to be demolished only a century later, in the 1820s. However, some secondary structures from that period do survive. The public park still contains two separately listed buildings, both dating from around 1760 (The Temple and a ruined boat-house grotto). The neighbouring St Mary’s Church, which was associated with the Wanstead Park estate, is the only Grade I listed building in Redbridge. The former stables of Wanstead House (now occupied by Wanstead Golf Club), are Grade II listed, as are a pair of eighteenth-century gate piers in Overton Drive, which are maintained by Redbridge. Turning to the landscape, the most visible legacy from Wanstead Park's past is a cascade of artificial lakes. However, though blurred by the passage of time and lack of maintenance, other aspects of the historic layout remain recognisable. For example, despite the devastation of the wooded areas in the 1820s and 1830s, when thousands of trees were felled for their value as timber, the footprint of the present day woodland in core areas of the park is similar to that in the late Georgian period. Connected to, and overlapping with, the Wanstead Park registered landscape is Wanstead Flats, which comprises an area totalling 334 acres. Once heathland with some wooded areas, much of it was landscaped in the early twentieth century and given over to recreation. However, the western portion was included by English Heritage within the Wanstead Park registered landscape as it contains important surviving (or restored) features from the "out park" of Wanstead House. The Flats in their entirety were historically connected with the Wanstead estate, and were formerly subject to a degree of landscaping, being crossed by avenues of trees. However, few - if any - traces of this are now discernable in the central and eastern portions. For the purposes of this archive, images have been tagged with "Wanstead Park" if they either relate to the area formerly enclosed in the park when it was under private ownership, or to that which falls within the registered landscape. The tag "Epping Forest" appears only against images featuring places presently under the care of the City of London. By far the largest single category of the images in the collection consists of photographic and other postcards dating between 1902-1914, though there are some items of both earlier and later date. Also included are some original photographs, as well as engravings, artworks and miscellaneous items. Please note that the images uploaded to eHive do not necessarily reflect the appearance of the originals, as many have undergone a degree of enhancement to make them clearer. The process of digitisation is part of the secondary justification for the collection: the preservation of images - many of them rare or even unique - printed using media which are chemically unstable and at risk of being lost. The reduced digital images on eHive have been uploaded as a free reference source for local historians and others. However, users are asked to respect the condition that they not be reused without permission. Full-size images in either their unrestored or enhanced state are available for a fee, though this may be waived at the owner's discretion for non-commercial or public bodies, or the media, subject to conditions. Donations of material to the archive are very welcome and offers to purchase relevant material will be considered. The owner's intention is to donate the collection to a suitable public archive in due course. "angel pond" art bandstand boating bridge "bush wood" children "church of st mary the virgin" colour "eagle pond" edwardian engraving "epping forest" "evelyn avenue" flood "forest gate" grotto "heronry pond" "hollow pond" ilford "lady victoria longwellesley" "leyton flats" leytonstone "magic lantern slide" "manor park" monochrome multiview "octavia barry" "oliver samuel dawson" "ornamental water" outfall "perch pond" photograph postcard printed "real photographic" recreation "refreshment chalet" "river roding" snaresbrook "swiss cottage" temple topographical transport victorian wanstead "wanstead flats" "wanstead house" "wanstead park" "west ham"